The Federal Republic of Germany’s position in the European Community had been described as one of interdependence, penetration and integration. 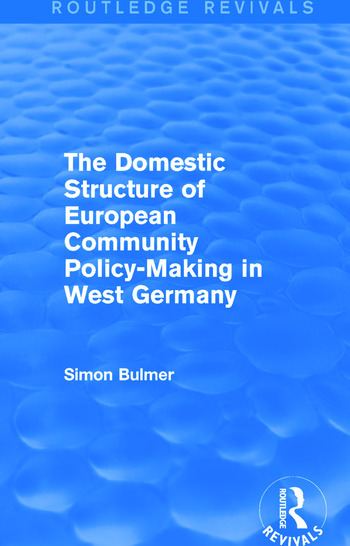 Of the three terms this research addresses itself most directly to penetration: to the links between the German political system and policy-making at the Community level. These links operated in two directions. Thus membership for the European Community (EC) imposed certain constraints on German domestic policy-making. Although this research, first published in 1986, concentrates on the structural inter-relationship between the German political system and EC decisions, its main focus of attention is the articulation of German ‘interests’ in the EC policy process. This book will be of interest to students of politics and history.